When it's time to go to sleep, I need two things-a big hug from my parents and my Babibunny Night-Light soft baby doll, which at 12 inches tall is a perfect size for me to hug and hold. I can just press on its tummy and a soft night-light comes on for five minutes and a series of eight tunes play to lull me to sleep. (No need to ask my parents to come and stop the music as my Babibear soft baby doll stops by itself.) 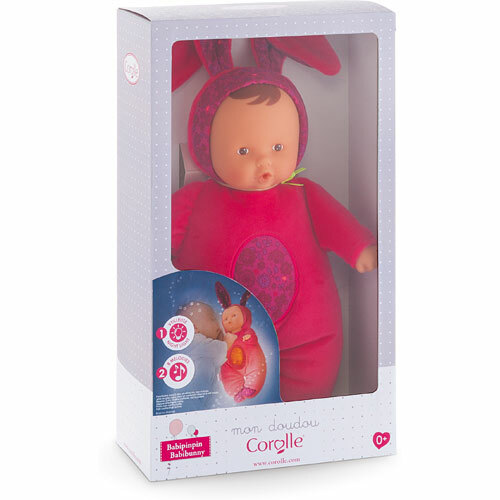 As I start to fall asleep, I feel comforted when I look at Babibunny's expressive vinyl face, delicately scented with vanilla-a Corolle signature. My Babibunny Night-Light Doll and I are inseparable, because even if I leave it somewhere, it can be returned to me thanks to the sewn-in label with space to write my name. 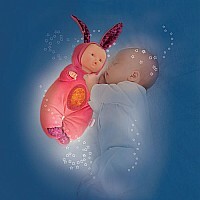 On a practical level, the battery box can be removed so that the Babibunny Night-Light soft baby doll can be machine washed-gentle cycle only. Requires 2 AA batteries, not included. From birth.